The Jewish Free Press, Calgary, April 11, 2014, p. 18. Blidstein, Gerald J. The Death of Moses: Readings in Midrash. Alon Shevut: Tevunot, 2008. Chazon, Esther G. “Moses' Struggle for his Soul: A Prototype for the Testament of Abraham, the Greek Apocalypse of Ezra and the Apocalypse of Sedrach.” The Second Century: A Journal of Early Christian Studies 5 (1985): 151-164. Elizur, Shulamit. A Poem for Every Parasha: Torah Readings Reflected in the Piyyutim. Jerusalem: Mossad Harav Kook, 1999. Elizur, Shulamit, ed. The Liturgical Poetry of Pinhas ben Jacob ha-Kohen. Sources for the Study of Jewish Culture 8. Jerusalem: World Union of Jewish Studies, 2004. Kasher, Rimon. “Two Targum-Tosephtas on the Death of Moses.” Tarbiz 54, no. 2 (1985): 217-224. “Midrasch vom Ableben Mosis.” Bet Ha-Midrasch 1 (1853): 115-129. Sacks, Jonathan. Rabbi Jonathan Sacks’s Haggadah : Hebrew and English Text with New Essays and Commentary. New York: Continuum, 2006. Stemberger, Günter. Introduction to the Talmud and Midrash. 1st ed. Minneapolis: Fortress Press, 1992. Walzer, Michael. Exodus and Revolution. New York: Basic Books, 1985. Alongside the memories of slavery and the thrill of liberation that define the moods of the Passover celebration, the story of the exodus involves a disturbing amount of collateral damage to innocent Egyptian bystanders. The traditional commentaries seem more likely to deal with this factor by disregarding it than by confronting it directly. There are nevertheless a number of texts that suggest that our sages could be distressed at the loss of Egyptian life, and that they raised some salient moral questions about the human price that was paid for the liberation of the Israelites. One such discussion arose in connection with Moses' review of his life as he was approaching his final days. Our great liberator comes across as a most reluctant leader, flustered by the historic responsibilities that were thrust upon him. In his first encounter with God at the burning bush, he tried to refuse his burdensome prophetic mission, and much of his subsequent activity was filled with the frustrations of shepherding an unmanageable populace, and of repeatedly interceding on their behalf when they provoked divine wrath. So worn and frazzled does Moses appear by the end of his life that it is easy to forget his beginnings as a wild and reckless vigilante who slew an Egyptian taskmaster for mistreating a Hebrew slave. The Torah itself does not pass judgement on Moses's action, and the episode’s principal function in the narrative is to provide a reason for his flight to Midian. That terse account of the killing of the taskmaster is open to many possible readings: Was Moses' deed sparked by an impulsive flash of indignation, or did he arrive at his decision after carefully weighing all the options? Was the Israelite victim's life in imminent peril, or was the mistreatment of a lesser degree? The Torah does not divulge sufficient information to base a cogent ethical evaluation of the episode. Though the slaying of the Egyptian oppressor may have been passed over abruptly by the biblical narrative in Exodus, the incident seems to have troubled the consciences of later Jewish interpreters. Some extraordinary instances of this concern may be found in works that were devoted to retelling Moses's final days. Several moving passages in the book of Deuteronomy are devoted to the great prophet's heart-rending pleas to be allowed to enter the promised land. The dramatic poignancy of this theme, combined with the fact that Moses's death is described in the closing verses of the Torah, inspired a special genre of literary creations whose authors imagined the dramatic dialogue that might have taken place between Moses and the Almighty. 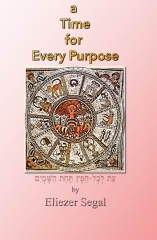 Some of these dialogues were included in the Aramaic translations (Targums) whose recitation used to supplement the reading of the Torah in the synagogues. Others circulated as separate volumes of "midrash." One of these works, stemming from the early medieval era, is known as "the Midrash about the Death of our Master Moses." In it, Moses challenges God to justify the shabby treatment he seems to be getting. After all, in the larger scheme of things, would it really make any difference if his life were prolonged just enough to allow him to tread on the yearned-for soil of the promised land? The Almighty appears hard pressed to come up with a persuasive answer. Initially he invokes the inevitable fact of human mortality. Moses, however, is unsatisfied with this argument, and produces a list of biblical figures who were no better than himself, but were treated with far more consideration. God, in turn, counters that even Moses cannot claim a life of untainted virtue. He was, after all, guilty of several sins of varying degrees of severity that were never deleted from his permanent record. In this context, the Holy One blurts out "Did I ever order you to kill that Egyptian?" Moses retorts with what might be excused as a chutzpah born of desperation: "You were the one who slew all the firstborns of Egypt— So is it fair that I should die now on account of a solitary Egyptian?" The exasperated divine response is that such a comparison is inherently absurd: "You are comparing yourself to me?! I have the power to bestow both death and life. Are you really capable of restoring life?" Although God is given the last word in this argument (at which point he immediately diverts the conversation to a different subject), it is by no means obvious that his position is being accepted by the story’s author. There is something in the Creator’s tone that is reminiscent of an infuriated parent stalemated in a fruitless argument with an obstinate child and forced to fall back on the claim "I'm the adult and I make the rules!" An intriguing variation on this theme is contained in a liturgical poem (piyyuṭ) composed by the prolific eighth-century poet Phineas ben Jacob Ha-Kohen, intended to accompany the closing verses of Deuteronomy. In Phineas’ reconstruction of the conversation between Moses and the Lord, the prophet suggests several possible incidents from his life that might have provoked the divine decree against his entering the promised land. Each of the suggestions, however, is rejected by the Almighty himself who condones Moses' conduct in every case. Under multiple layers of obscure poetic allusions, the Israelite leader is arguing that, even if the blood of that slain Egyptian is demanding vengeance by means of Moses's untimely demise, the Creator should not be deceived by that spurious argument. After all, Moses did not slay the evildoer until he was satisfied (presumably, through his prophetic insight) that not only was he irredeemably wicked, but no righteous person was destined to be descended from him for all future generations. The assumption underlying this exchange is that human life is so precious that even if the Egyptian himself was a depraved criminal, it would still have been wrong to kill him, if only on the remote chance that he might eventually produce a worthy descendant. In this version of the discussion, the Almighty reassured Moses that the Egyptian had no redeeming virtues and was fit to be consigned to eternal flames. That particular act of violence had no impact on the decision to end Moses' life, a decision which was determined by the inscrutable considerations of divine wisdom and human mortality. Rabbi Sacks made use of this insight to explain the vastly different outcomes of various modern revolutionary movements: only the English and American revolutions, which drew inspiration from the exodus narrative and the biblical conviction that all authority is subject to the transcendental demands of the moral law, produced free societies and political systems that honoured human rights; whereas the ideologists of the French and Russian revolutions, who arrogated supreme power to humans and to the state itself, could not restrain the ruthless exercise of their leaders’ ambitions, and hence degenerated into reigns of terror. Seen this way, the lofty standards that were demanded of Moses may continue to define the ideals of freedom for future generations.